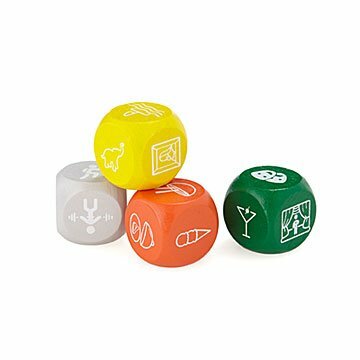 Map out a fun-filled day with a roll of these four activity-generating dice. Should we go out to a fancy dinner, or find the best tacos in town? Go for a scenic hike or work on our yoga asanas? Explore a museum or hit the beach? This set of activity-determining dice is organized into four color-coded categories (Exercise, Sights, Food, and Nightlife) to help you map out a fun-filled day, whether you're on vacation or enjoying life in your own backyard. It makes a great gift for indecisive types, adventurous families, and anyone who could use a shot of spontaneity. Made in China. Such a clever idea for creating clever ideas! I bought this for some friends. I think it'd be great for date night ideas or family outings. I may buy this for my own family one day. Honestly, UncommonGoods.com is my favorite website to shop from. Everything is unique, creative and fun. Great idea when you don't know what to do. Perfect for spring break or a rainy day. We always say I don't know what do want to do? These make that discussion fun and hilarious. A Must Buy for the indecisive! This has been so much fun and so helpful when it comes to deciding or guiding your decision for fun activities! My friend and I often want to go out and do something, but have a hard time deciding which direction to take. These are perfect for those of us who are indecisive! GREAT for couples and friends!! We don't have a lot of money to go out, but when we do we can never decide! so we used these and have an adventure! Great to save us time, and you can use one of the dice or all! So fun for date night! If anyone is looking for fun date plans this is perfect! You can roll the dice and it's a surprise what you will get! It's fun looking up new activities and places that the dice lands on to make it even more fun!